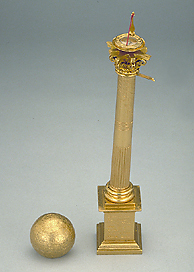 Sundials in the form of pillars are not uncommon, but this example, in the form of a Corinthian column surmounted by a terrestrial globe, is more unusual. The parts of the column can be detached and the globe lifted to reveal a small string gnomon dial with hour lines around a compass. The instrument is not signed but the base of the column is inscribed on four sides.